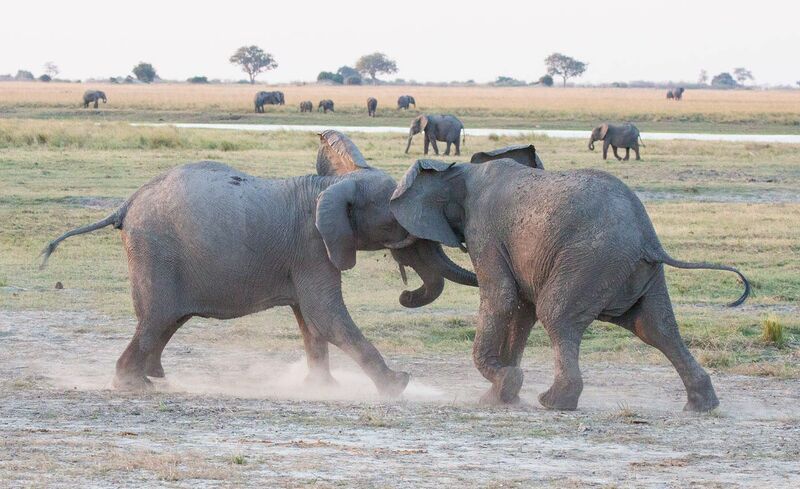 Chobe National Park in Botswana is the place to go to see African elephants. We spent the most amazing three days here on safari. 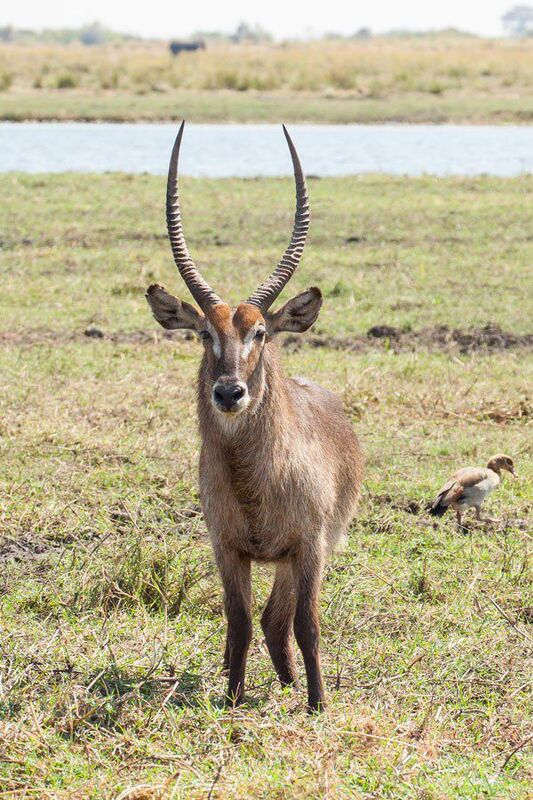 During the day we took boat trips on the Chobe River and went on game drives in the park, searching for elephants, lions, giraffe, and numerous other African animals. 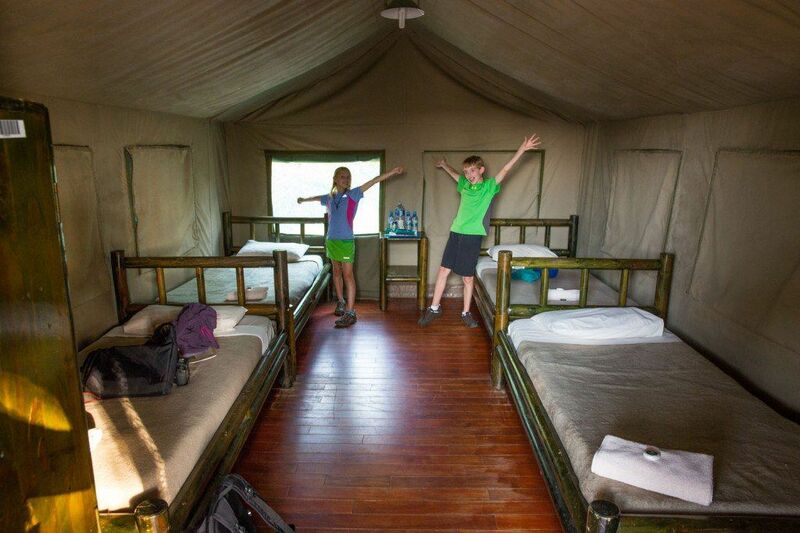 At night we slept in tents around a campfire, with the sounds of elephants and lions in the distance. It was an unforgettable experience and one of the best experiences of our trip around the world. Our adventure started on a Tuesday morning with a boat trip up the Chobe River. The six of us (the four Earth Trekkers and Kathy and Valerie) got our first close up views of elephants, hippos, and water buffalo. We watched as elephants ate their breakfast, crocodiles basked in the sun, and hungry hippos munched on grass. We watched as herds of elephants walked to the river, swam across, and spent the morning munching on grass on Sedudu Island. The younger elephants loved to play in the water, just like kids. By the way, Tyler and Kara loved this. I am sure if you ask them, this experience beats any museum or zoo we will ever see. 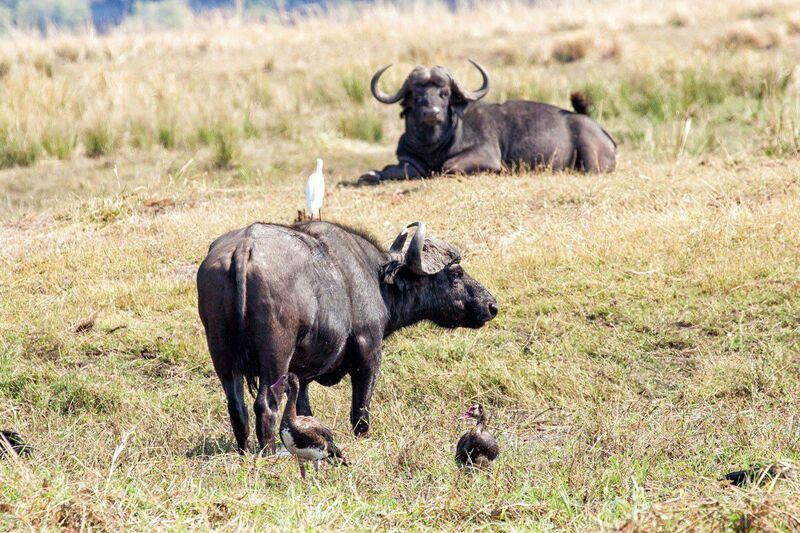 The boat trip on the Chobe River was awesome, and our day would get even better with the afternoon game drive. The six of us plus a young couple from Europe shared a safari Jeep, driven by our guide for three days, Lance. 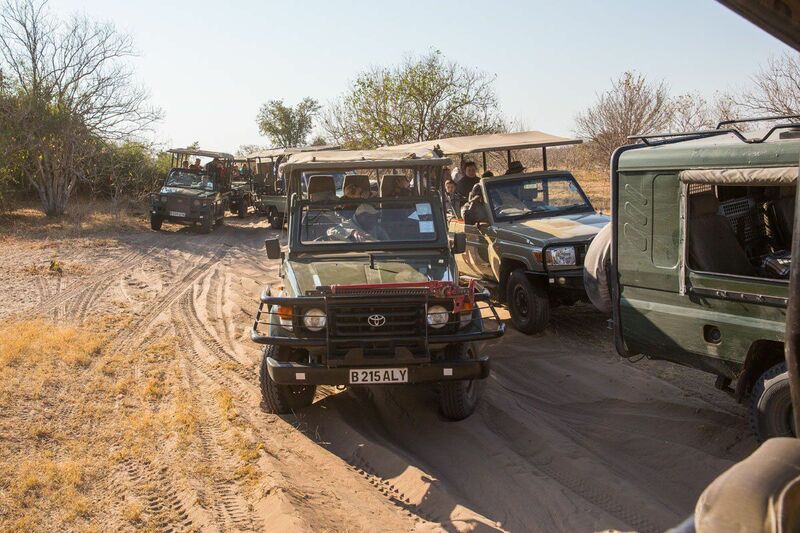 We bounced along dusty roads in Chobe National Park, on the search for more wildlife. 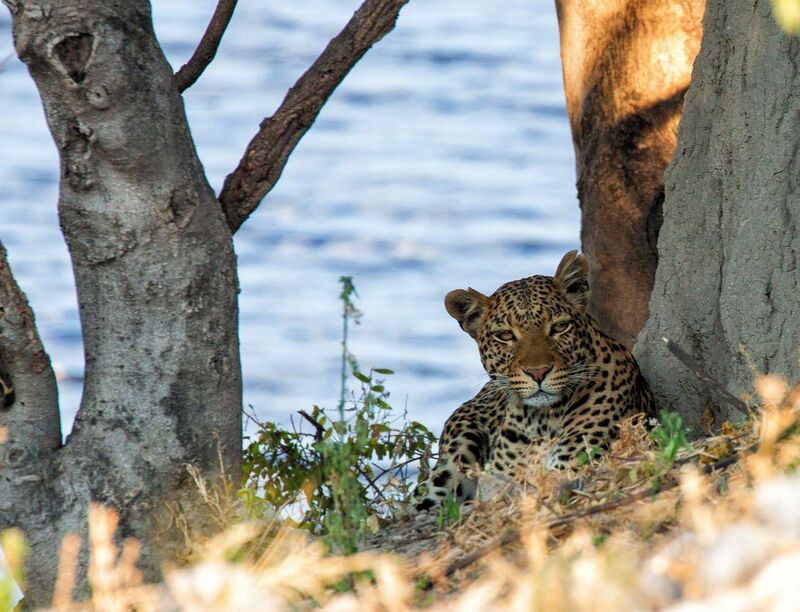 Finding animals in Chobe is a very easy thing to do. 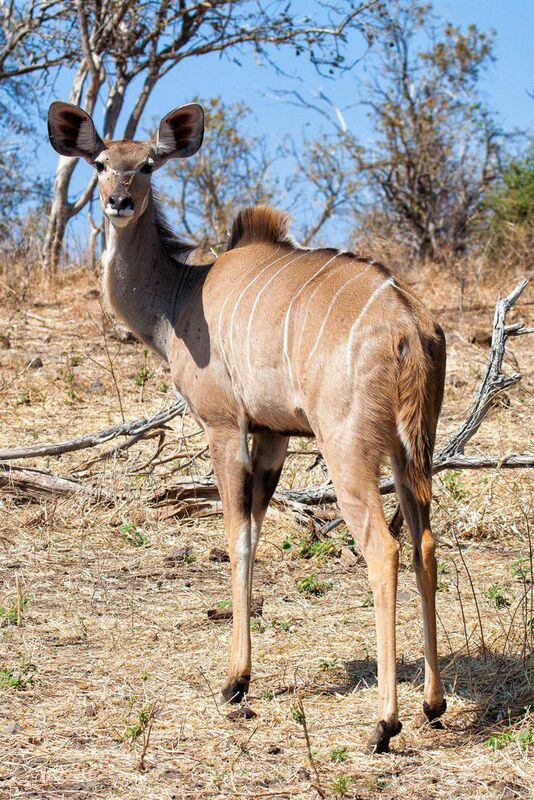 It was amazing the number of impala, elephants, giraffe, zebra, and buffalo we saw. 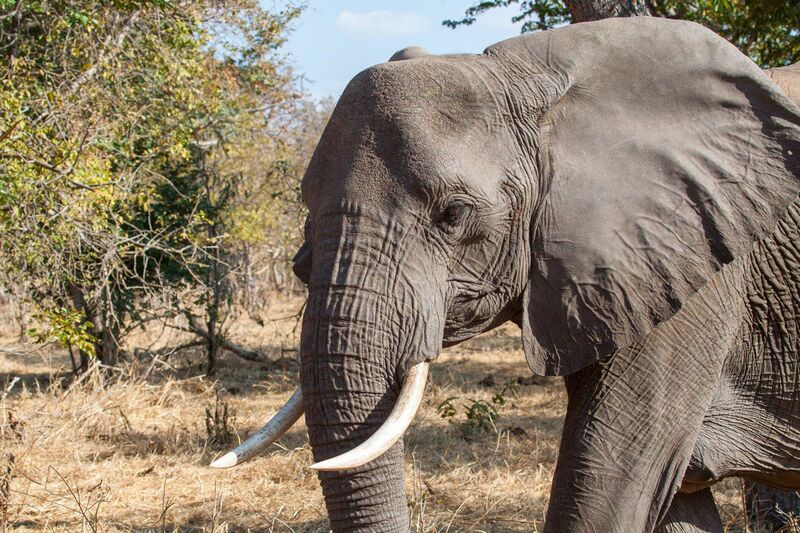 Seeing the elephants was the highlight of our visit to Chobe. 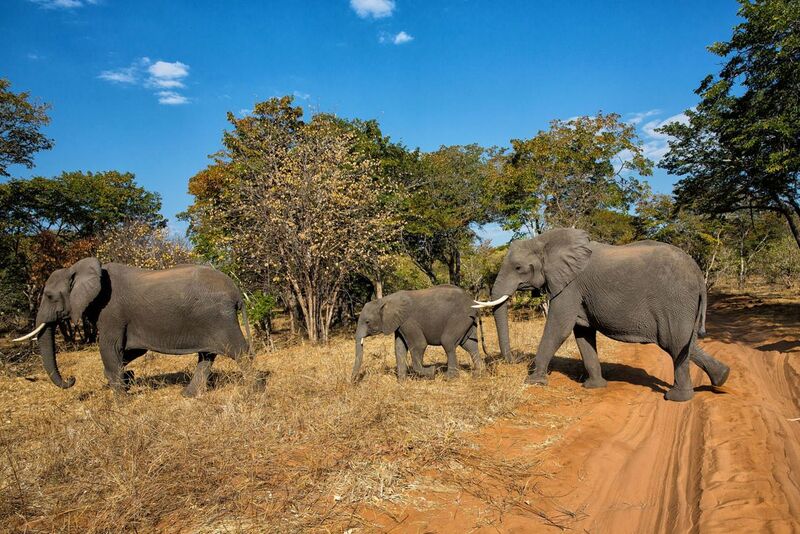 Chobe National Park is famous for its large numbers of elephants. 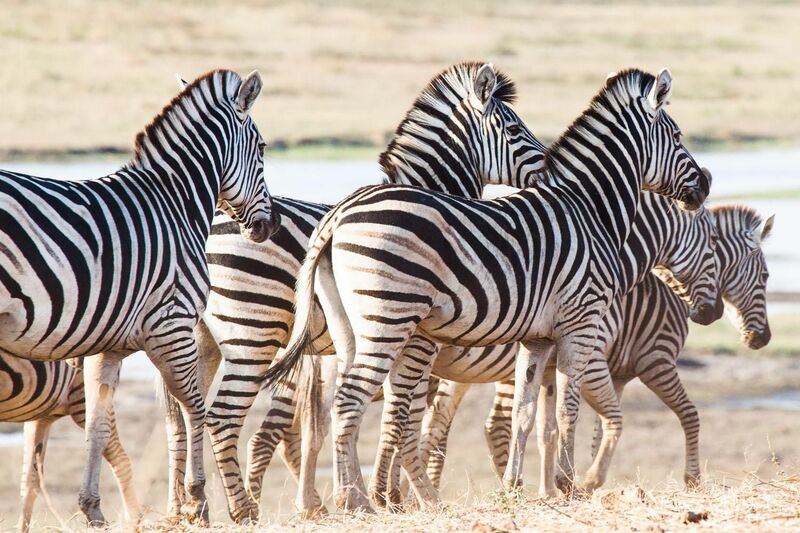 We visited Chobe in the dry season, prime viewing season as animals flock to the last watering holes. 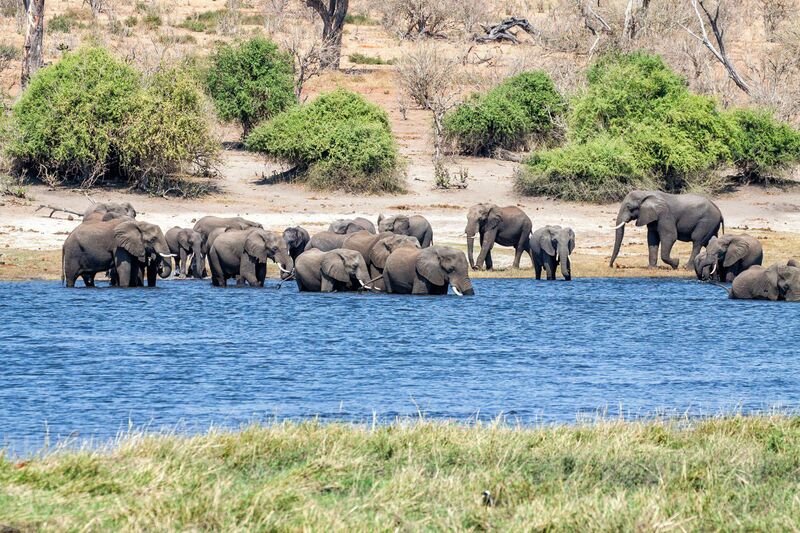 The Chobe River supports a large amount of elephants and other animals and we were here at prime time. The giraffe are beautiful, but they are somewhat awkward when they run. Later in the afternoon Lance got a call that there was a leopard sighting. We sped off in our Jeep, joining about seven other safari vehicles, all trying to get the best view of this leopard lounging by the river. 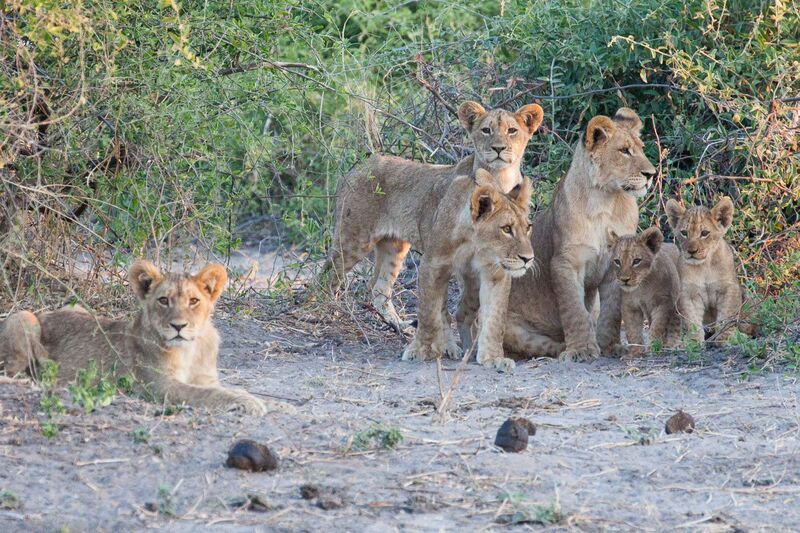 The way we were facing in our Jeep, if I looked to my left, there was a pride of lions. Just to our right, along the Chobe River, were herds of elephants. It was unbelievable!! 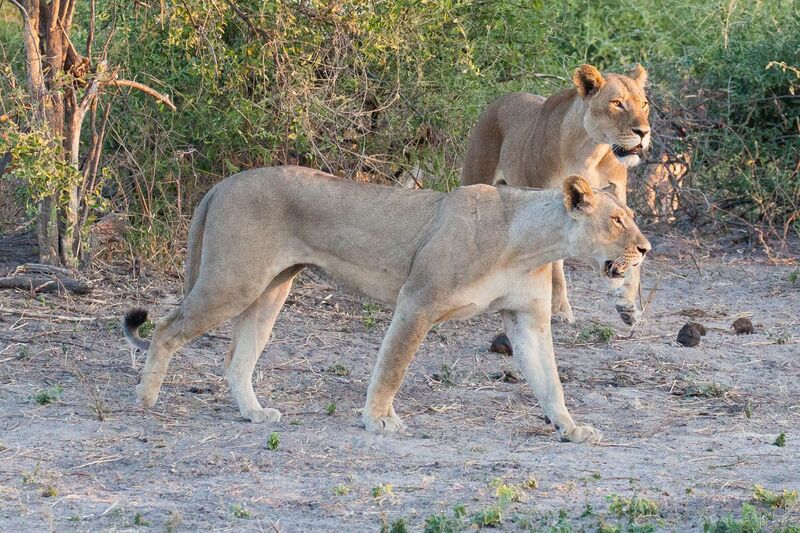 The elephants were rumbling and growling at the lions, the lions were looking on rather indifferently, and multiple safari Jeeps were caught in the middle. I was more curious than apprehensive and just thrilled to be witnessing all of this. Our night ended with dinner around a campfire and our first night sleeping in tents. During the night we heard elephants, baboons, lions, jackals, and other animals I couldn’t identify. We loved every minute of this experience! 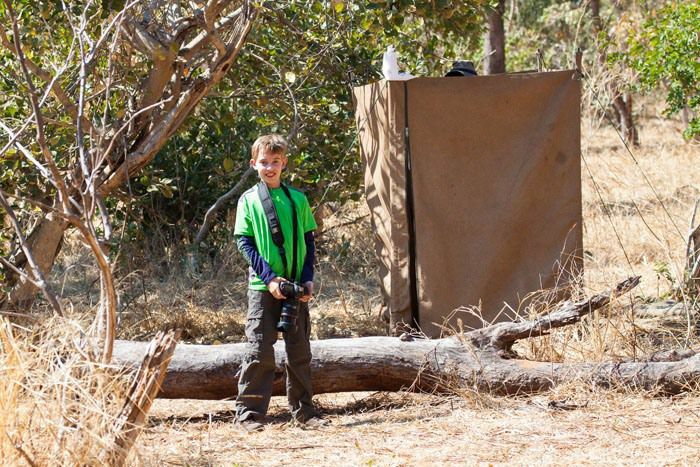 Our second day was spent with a morning and an afternoon game drive, with lunch and siesta at the campsite in the middle of the day. Animal spottings were still amazing. We had another leopard spotting. They really are difficult to find in the tall, dried grass, and it is amazing how quickly the guides can spot them. During our midday siesta time we took some time to do some school work. Kara took her math test in the back of the safari Jeep, probably the coolest place ever to take a test! 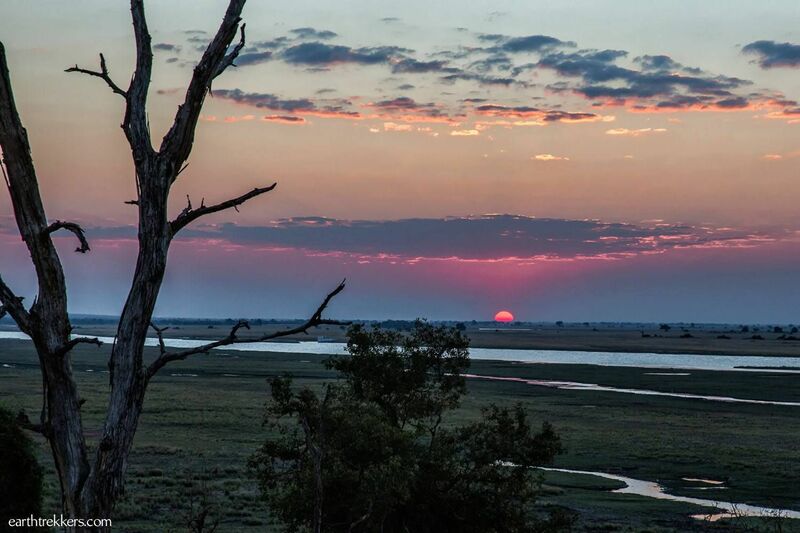 After more animal spottings during our afternoon safari, our day ended with a Botswana sunset. 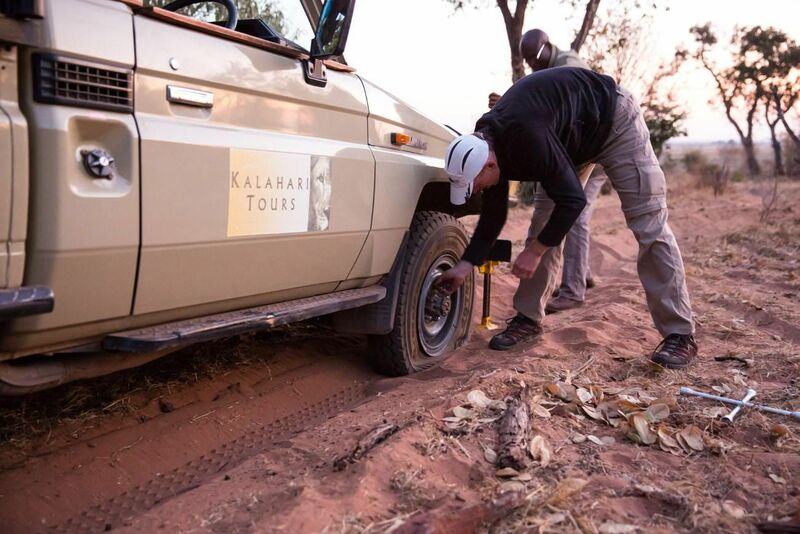 Our final morning started out a little slow, as Lance discovered we had a flat tire. Tim helped change the tire and we were on our way again. 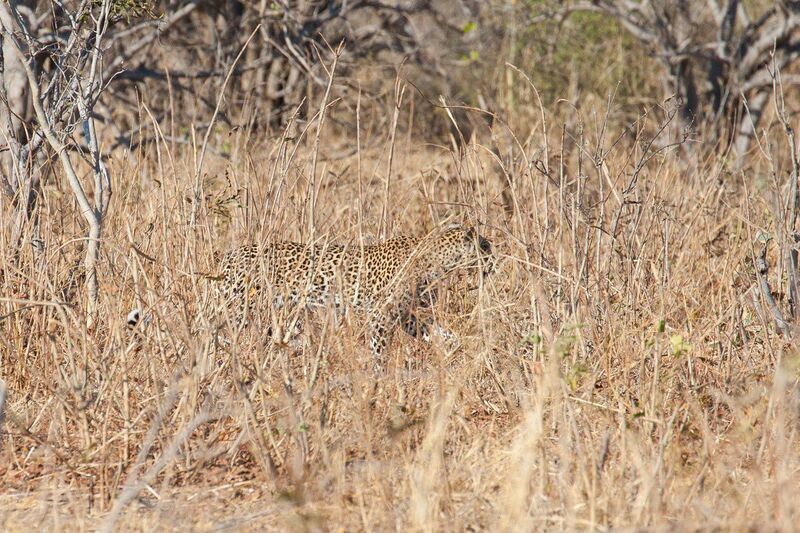 We had another leopard sighting, which was amazing. Three days in a row! Maybe it’s the same one we keep seeing. This time we watched as the leopard lay in the grass as grazing impala slowly wandered closer towards him. 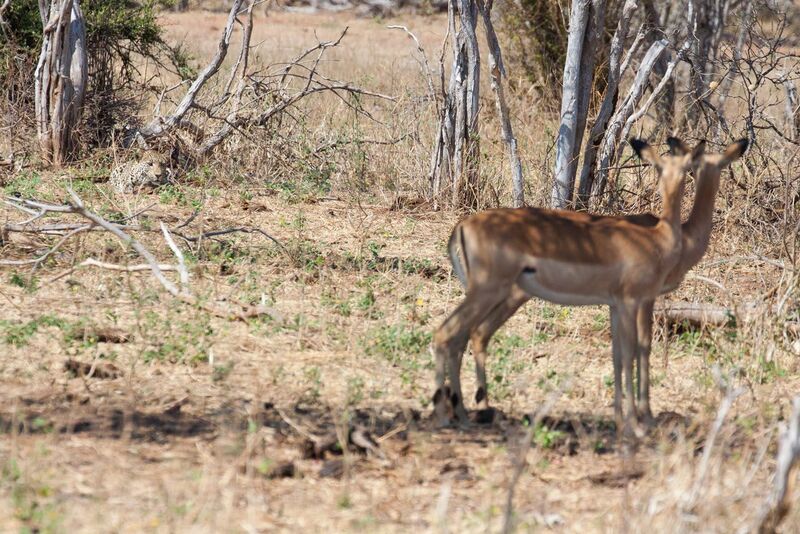 We were hopeful for a chase but the impala eventually spotted him. Bummer! Finally, we saw tons of warthogs and baboons all over the place, and vervet monkeys were always found near humans, as they love to come steal our food. Our day ended with another boat trip on the Chobe River, which Tim and I did not take, as we were in the midst of our first trip related stomach troubles. 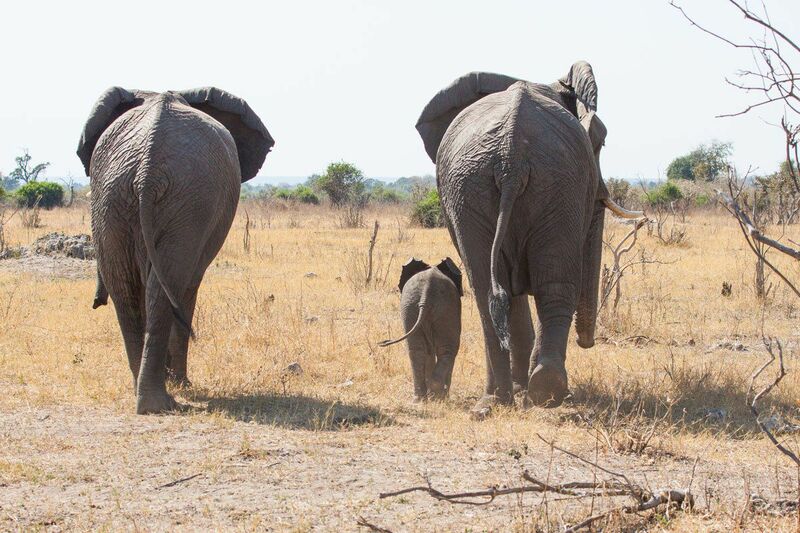 Tyler, Kara, Mom, and Valerie all enjoyed their last views of herds of elephants on the Chobe River. 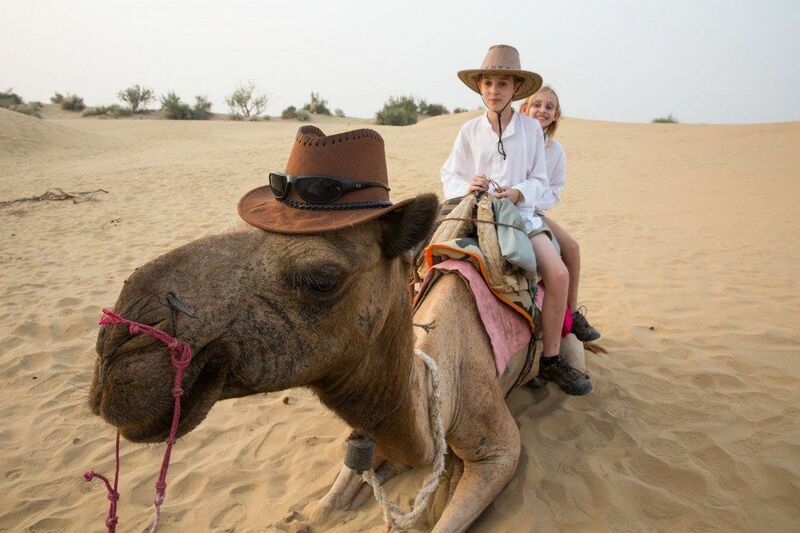 The camping safari was amazing. It was so much better than I ever expected. At times we were within ten feet of elephants, twenty feet from lions. We saw so many animals it was unbelievable. 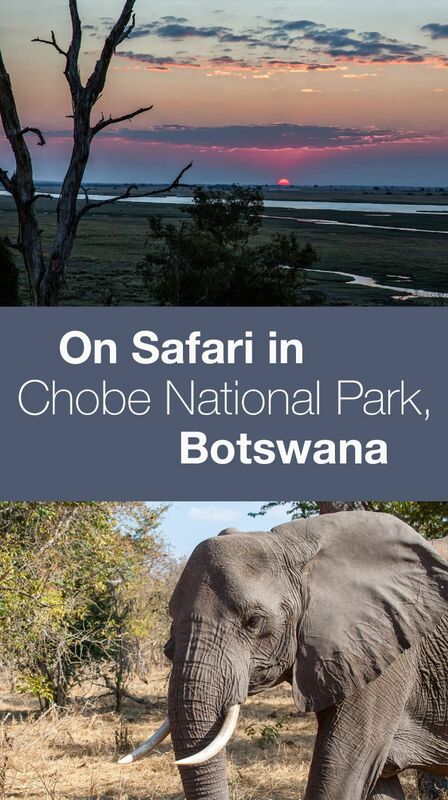 I am looking forward to our next safari adventures at Kruger, iSimangaliso Wetland Park, and Addo Elephant Park, and am wondering if they will beat our Chobe experience. 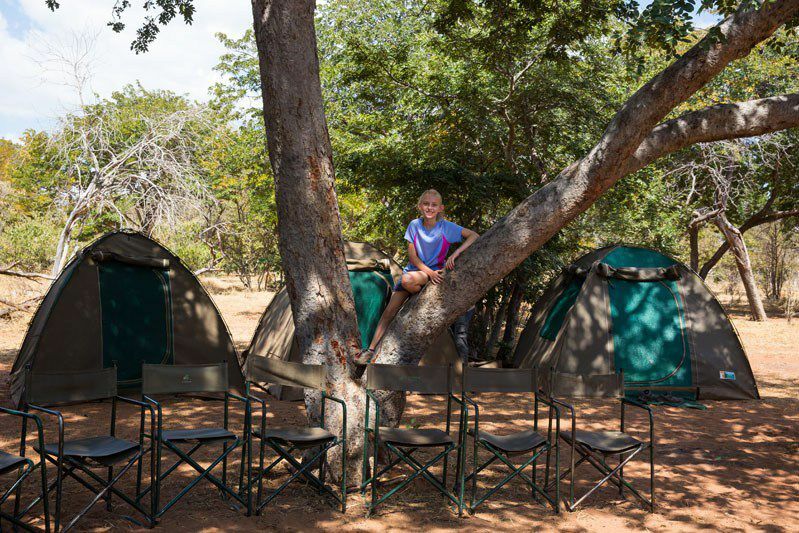 In order to go on an African safari and stay within budget, we booked a three-day two-night camping safari with Kalahari Tours. Our guide, Lance was wonderful, and the game drives and the two boat trips on the Chobe River were fantastic experiences. Overall, with the number of animals we saw and Lance’s wisdom and wicked ability to spot leopards, it was a great experience. Meals and living conditions were not as great. During the first night of our safari we had to sleep outside of Chobe National Park, since Kalahari Tours did not reserve a campsite in the park for our group. It was a disappointment not getting the “true” safari experience both nights. Also, the food was mediocre, and there were a number of people in our group, including me, Tim, Valerie, and Tyler, who all got a mild case of food poisoning. We are going to be in South Africa for around 2 1/2 weeks in July. We are enjoying most of the sites you suggested along the route from Cape Town to Port Elizabeth. On the last 5 nights / 6 days of our stay we are contemplating a flight into Chobe from Port Elizabeth, or a flight to Kruger. 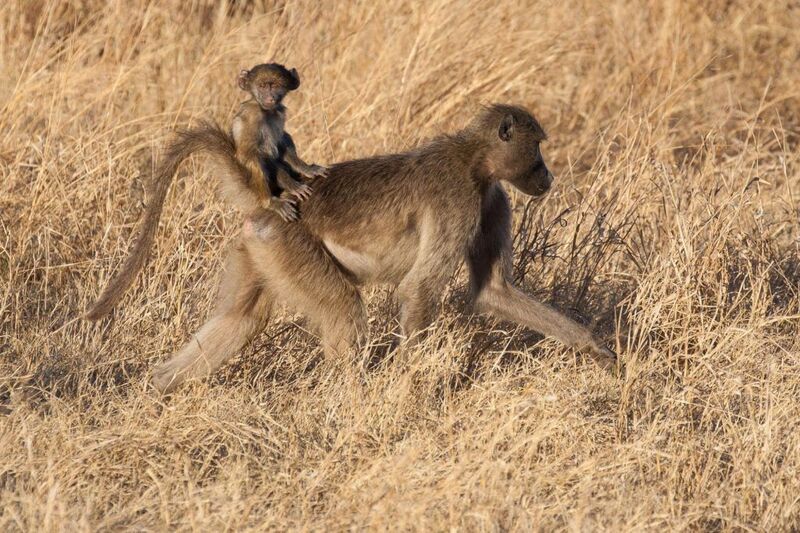 Chobe would be out of the route a bit, but if you think this is the better option, we would certainly choose this option. 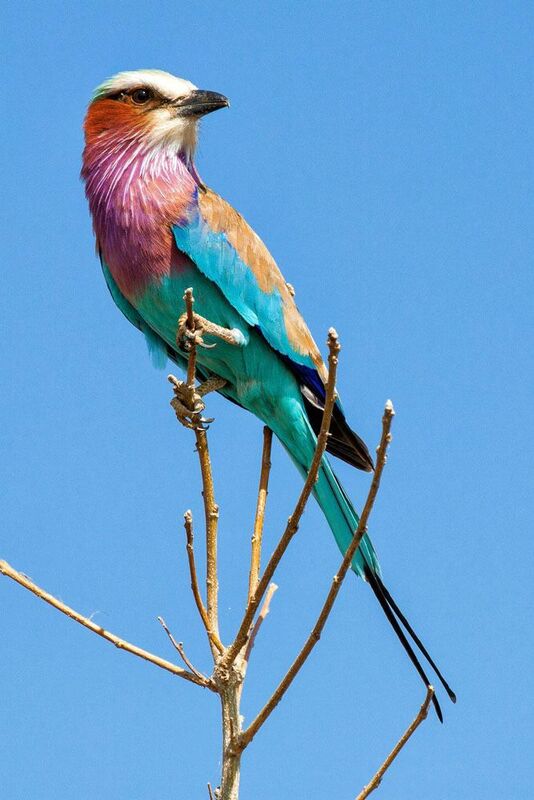 I’ve read that the Okavango Delta is particularly exceptional in July. With our time constraints, and with these options, which might you suggest? 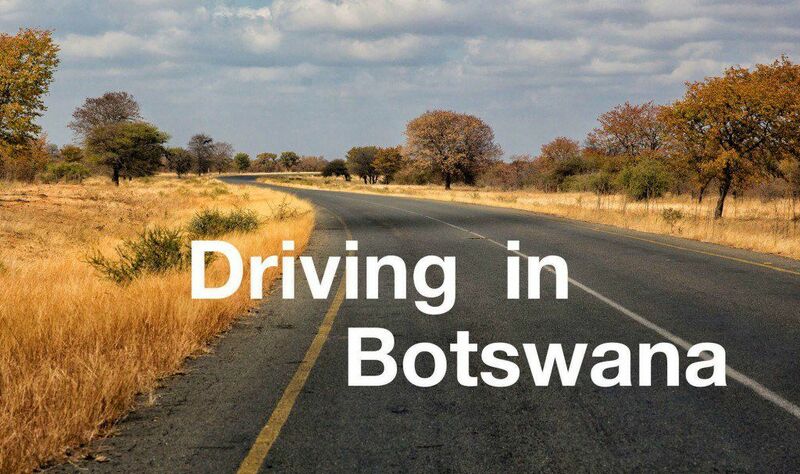 We leave South Africa from the city of Johannesburg due to the more inexpensive flight options. Loved reading your blog and seeing the awesome pictures. We did a day trip to Chobe national park a few weeks ago and had an amazing time. We spent over an hour just observing leopards on trees and as they walked around and changed trees. You got incredibly lucky with leopard sighting every day and the lion pride! Sorry about the food poisoning. Hopefully the rest of your trip was great. 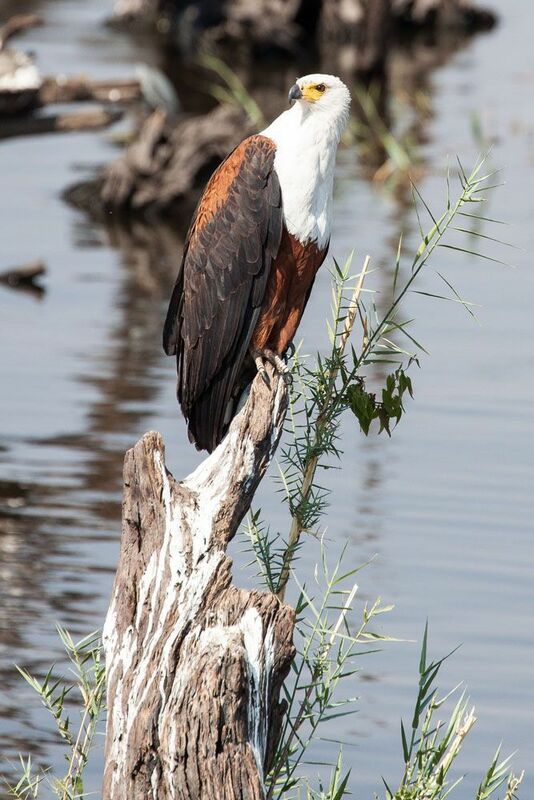 We went to Chobe this summer and had a fabulous experience. We stayed at Muchenje which was billed as a mid level lodge – it was fantastic! We loved the food and accommodations and had a spectacular time. Hi there. 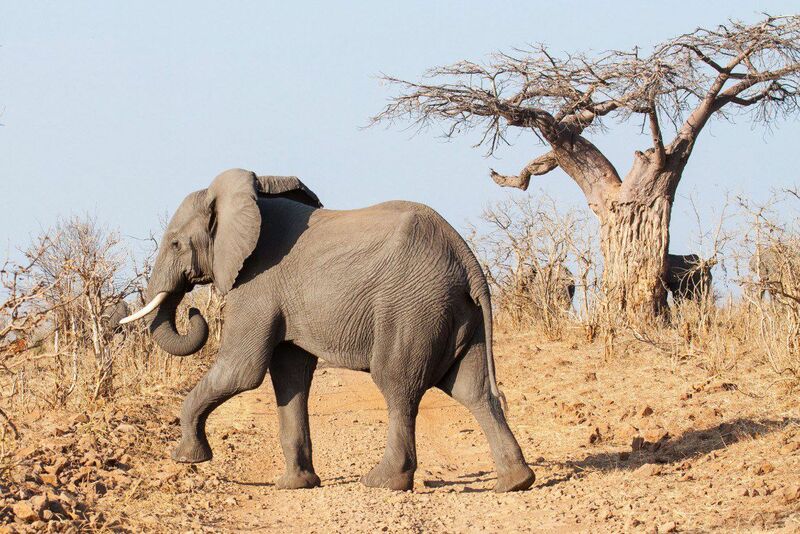 I have just come across your excellent page & note that you used Kalahari Tours for your safari in Chobe NP. Can I ask if you would recommend them? Thanking you in advance.